There’s little I enjoy more than wallowing in the depths of a dark depressing story, but even my cold black heart isn’t averse to watching films which leave you feeling that little bit warmer inside. Step forward New York based filmmaker Jean Claude Billmaier who has just the thing with his endearing bug band music video The Letterbox – the first track to be taken from Broadway Actor/Musician Ryan Vona’s debut album Somebody. 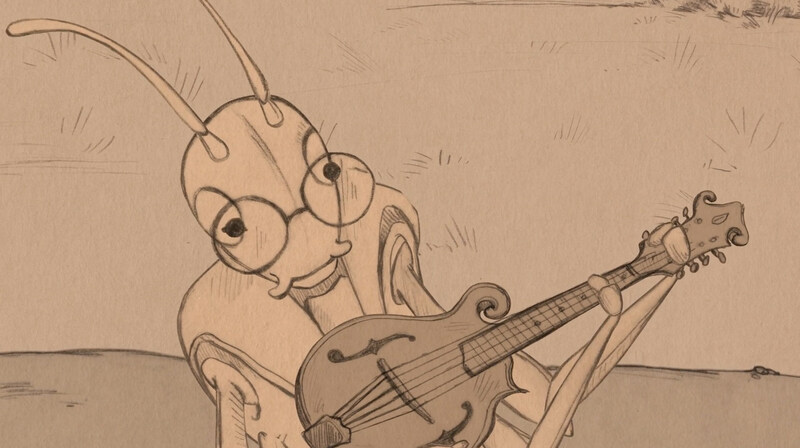 Jean discusses his close collaboration with animator Dennis Fries and how the pair ensured the insect musicians kept time when playing their instruments. Max Pava, one of the producers of the piece and a good friend of Ryan’s (the artist) approached me with the idea to develop a video based on the original album art. Crafting something using both hand drawn and digital imagery excited all of us at Marabigo. My immediate impulse was to bring in one of the best animators I know: Dennis Fries. We had a couple brief meetings, and a big brainstorming session where we bounced around story ideas, mainly from Ryan, who had a clear vision for the aphid protagonist (Twigsby), and voila! We went onto shot lists, storyboards, and then rough illustrations. Ryan is currently the lead performer in Cirque du Soleil’s Broadway show Paramour so we wanted to release the piece asap to get it the momentum it deserves. Once we solidified the shot list, we put together an animatic / edit that roughly sketched out the progression of what would be the full animated video. After we were happy with it, the extremely talented Lauren Rubin did her magic – creating hundreds of hand drawn illustrations that would later be scanned, digitally altered and would eventually become digital puppets. After that, the animators came in and started working, Dennis worked long hours with the help of Animator Robert Kornstein to animate each shot and character. From beginning to end the project took about four months to complete. I would say the main production / animation period took about a month. As we were animating we were also testing styles: initially we thought we’d go with a colored piece, so we tested a multitude of color passes. After several tests, we realized the piece looked and felt more natural with a shadow palette on textured paper, something storybook and folksy – so we went that route! We took a week or so to find the texture we ended up using, going to a few stationary stores around NYC to get samples and scan them. We settled on stock imagery that we modified in Photoshop. Once all of this was completed, we were able to package it and finally release it! All assets were created initially by hand, after we scanned we used Cintiqs with Photoshop and After Effects to build the rigs. We then used Kyle’s Brushes to touch up the digital assets in PhotoShop. To animate the bugs playing the instruments, Dennis rigged the puppets with a script that would interpret waveforms into keyframes – so what you’re seeing is actually quite close to reality since the bugs move to the waveforms! We ended up grabbing each bug and connecting it to their solo instrument track so they could move as close to actuality as possible. As a final step we took the piece to Premiere to polish the edit and finesse. I’m currently working on the production of a long time passion project titled The Secret of Spring which is slated to shoot this September. It’s an exploration of love unfolding. At the same time I have 3 other projects in post on the commercial front, so hopefully you’ll see releases for those in the upcoming months.